Paris and Washington, D.C. (March 20, 2019) UNESCO Director-General Audrey Azoulay, and UNESCO Goodwill Ambassador Herbie Hancock today announced the programme for the 2019 edition of International Jazz Day, which will be launched in Australia and celebrated in more than 190 countries around the world. 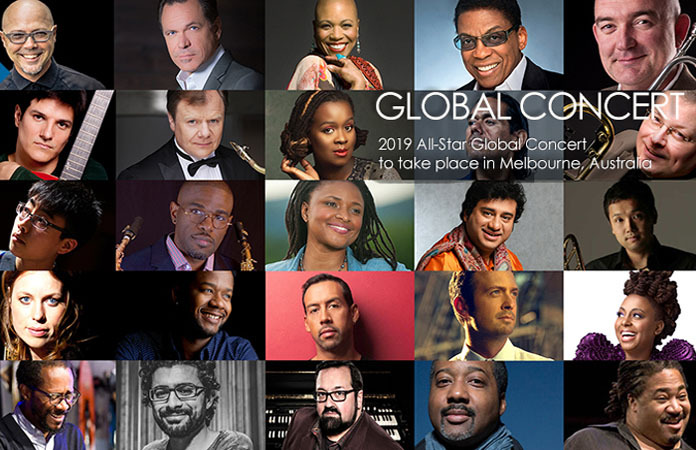 Iconic jazz pianist Herbie Hancock (USA) and acclaimed trumpeter James Morrison (Australia) will serve as artistic co-directors of the All-Star Global Concert, and John Beasley (USA) will serve as the evening’s musical director. The concert will feature performances by an international roster of artists from more than a dozen countries. Confirmed artists include: Cieavash Arian (Iran), William Barton (Australia), Dee Dee Bridgewater (USA), Till Brönner (Germany), A Bu (China), Igor Butman (Russian Federation), Eli Degibri (Israel), Kurt Elling (USA), Matthew Jodrell (Australia), Ledisi (USA), Eijiro Nakagawa (Japan), Mark Nightingale (United Kingdom), Chico Pinheiro (Brazil), Tineke Postma (Netherlands), Eric Reed (USA), Antonio Sánchez (Mexico), Nathan Schreiber (Australia), Somi (USA), Lizz Wright (USA), Tarek Yamani (Lebanon). More artists are expected to be announced. To find out more about International Jazz Day and register events on the official website: www.jazzday.com or www.unesco.org/jazzday.